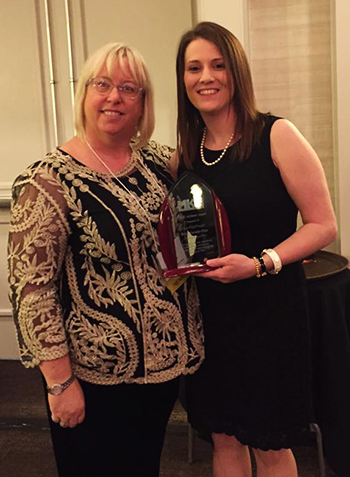 Brice Harader-Pate, Upward Bound and Cowley College alumni, ER and Family Health Nurse Practitioner, was awarded the 2016 MO-KAN-NE Trio Achiever Award at the Chapter Banquet in Kansas City, MO on March 31. MO-KAN-N​E (MKN) is the 3-state chapter of the Educational Opportunity Association (EOA), one of the 10 regional associations in the U.S. that form the Council for Opportunity in Education (COE). The Council represents TRIO programs nationwide. There are 137 TRIO programs in the MKN service region with approximately 39 million dollars going to programs that help serve over 43,000 participants. TRIO is a set of federally-funded college opportunity programs that motivate and support students from disadvantaged backgrounds in their pursuit of a college degree. The MKN TRIO Achiever’s Award is given in recognition of the successes and outstanding endeavors of TRIO alumni from within the three-state chapter and the programs that supported them in their journey to accomplished careers. Each candidate must be a person of high stature within his/her profession and/or has received recognition for outstanding accomplishments. The candidate also must have made significant civic, community or professional contributions. Harader-Pate was nominated by Liz Shepard, – Upward Bound TRIO Program Director. She felt Harader-Pate was a perfect fit for this award.